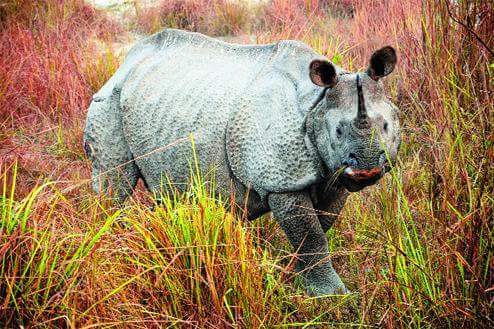 Bengal forest minister Binoy Krishna Burman today said he had asked senior officers of his department to find out if there were any lapses in keeping vigil on Gorumara National Park where carcasses of two rhinos killed by poachers were exhumed yesterday. "It is indeed a matter of concern that two rhinos have been poached and the carcasses were buried inside the national park. We have passed a clear instruction to senior officers of the forest department to carry out a detailed investigation and check out whether there were lapses in keeping vigil in the park. If anybody is found responsible, necessary steps would be taken against him," he said. Sources said four alleged poachers had died in a car accident near Guwahati in Assam on March 14. Another person in the car, identified as Jacob, survived the crash and is still under treatment. "As police and forest officers searched the car, they found a rhino horn, some narcotic and a map of Gorumara forest. Later, they spoke to Jacob who admitted that they had killed rhinos in Gorumara. Accordingly, we were informed a few days ago and started an investigation," R.P. Saini, the additional principal chief conservator of forests of the state, said today. Saini, along with Pradip Vyas, the principal chief conservator of forest (wildlife), has been camping in Gorumara since yesterday. Based on the information they got from Assam, the foresters started searching the entire park and could recover the carcasses. "Both the carcasses have been exhumed. It appears that one is a male and the other is a female and both have bullet injuries. We will send our officers to Assam to speak to Jacob and obtain more information about poaching rackets," a forester said. Unconfirmed sources said since yesterday, the foresters had detained four-five persons, including the owner of a private lodge located close to Gorumara, where Jacob and others had stayed. Questions have been raised within the state forest department about the efficacy of vigilance in Gorumara. "It is high time to intensify vigilance in Gorumara and all other reserve forests in the state. We believe the department will shortly do an assessment on different parameters to know whether vigil is kept in these forests in an effective manner," said a forest officer who didn't want to be named.